Facet joint arthritis is a universal part of spinal aging that will usually not cause any significant or chronic symptoms. Of course, some minor pain is considered normal and should not be a major cause for concern. However, some forms of arthritis can be painful and pathological. This includes rheumatoid arthritis and rare instances of severe osteoarthritis that can enact mechanical or neurological pain in the zygapophyseal joints. Arthritis is generally one of the most misunderstood of all health issues. Most people view arthritis as a disease that requires a cure, instead of its reality as a typical consequence of aging that can never be “cured”. The medical industry perpetuates many myths concerning arthritis, since treatment is so incredibly easy and profitable for all manner of care providers. This discussion focuses on explaining arthritic facet joint conditions and dispelling many of the misunderstandings held by patients and doctors alike. We will detail the usual and mostly harmless form of osteoarthritis, as well as provide insight on pathological osteoarthritic scenarios and rheumatoid arthritis, as well. Arthritis describes a breakdown in the protective mechanisms in the bodily joints and the subsequent collateral effects on bone and joint form and function. The most common variety of arthritic process is called the osteo (bone) form. This condition is considered to be completely normal, universal and expected in all adults past the age of 40 or so. Arthritis can be found all over the body, with the most common locations being the hands, knees, ankles, shoulders, elbows, wrist, hip and spine. In the spine, the arthritic processes are wide-ranging and affect multiple structures, including all the spinal joints, as well as the vertebral bodies. Facet joint arthritis is just one form of spinal bone degeneration and this specific variety is the subject of this very article. The facet joints usually feature protective cartilage covering the bony surfaces of the joint that overlap and interact as the spine moves. These parts consist of the inferior articular process from the vertebra above and the superior articular process from the vertebra below. Surrounding this joint is a capsule made from ligaments and other soft tissues. Contained in this capsule is a lubricating fluid that helps the joint to reduce friction and work smoothly through its typical range of movement. In its entirety, the facet is called a synovial joint and is one of many of these types of bone joinings throughout the human anatomy. Facet arthritis describes the deterioration of the cartilage and the loss of the synovial fluid in the joint capsule. This causes the skeletal edges of the vertebra to interact directly and results in the formation of osteophytes in, on and around the facet joint tissues. Although this sounds horrible, most cases of osteoarthritis are not pathological or painful in any way, although all have the potential to become so. Most patients who do experience symptoms simply experience minor pain and some stiffness in affected areas and do not require any professional treatment. Pathological forms of osteoarthritis fall into several categories of severity. On one end of the spectrum, there are patients who demonstrate completely normal degrees of arthritis, but experience a focal region of pathology, such as a single bone spur in a problematic location. On the other end of the spectrum are patients who demonstrate extreme forms of osteoarthritis that cause widespread vertebral spurring and might require drastic intervention. Most facet arthritis will not reach significantly symptomatic levels. Of the cases that do create symptoms worthy of evaluation, most will fit the first category of focal arthritic accumulation that can be easily resolved. Only a small minority of patients will display large accumulations of problematic osteophytes that will require a more comprehensive and invasive care regimen. It should be noted that specific expressions of arthritis can be successfully treated, but there is no cure for the arthritic processes, nor is any cure actually or inherently needed. Arthritis is just a part of getting older and will definitely affect the spinal joints past a certain age. Even when focal examples of arthritis are treated, the arthritic processes will continue to progress for life. 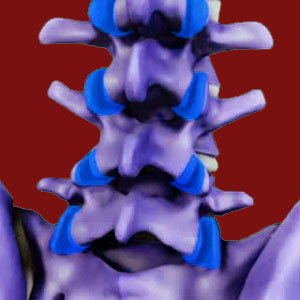 Rheumatoid arthritis and similar conditions, such as ankylosing spondylitis, can also affect the spinal facet joints. These are actual diseases and do not qualify to be called normal or typical in any way. Rheumatoid arthritis is an inflammatory form of bone degeneration that usually affects large areas of the anatomy and tends to favor the major joints of the body. Spinal RA is a severe health issue that can create visual deformity of the spine and posture, as well as severe pain, functional limitation and complete disability. Rheumatoid facet joint arthritis is known to exaggerate the visual appearance of the facet joints externally. Other common expressions include hypomobility and even the occurrence of organic fusion of the joints. When this occurs, the incidence of facet joint fracture increases significantly and might require surgical repair. RA is an autoimmune disease, and as such, has links to the mindbody process. There are alternative treatments which do not involve any drugs or surgeries that have shown great promise for reversing the actual underling causative mechanism for the condition to develop. We will discuss these therapies in our dedicated coverage of the condition.